Astell & Kern AK240 makes its UK debut at Bristol Show 2014 | What Hi-Fi? Astell & Kern is making quite a splash here at the Bristol Show with the UK introduction of its £2200 AK240 hi-res portable music player, first unveiled at CES in Las Vegas last month. 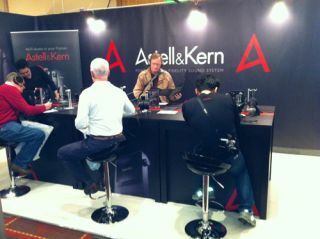 If you can make it to the show, you can try it out for yourself on the A&K stand. The launch of the AK240 marks an expansion of A&K's range of portable audio players and builds on the success of the AK100 and AK120 – introduced to the UK late last year. In addition to a brand-new look, the AK240 includes a series of new features not currently offered by any other high-res portable players on the market. The new features include 256GB internal memory and one microSD card slot supporting up to 64GB of microSD card storage – resulting in a total of 320GB of music storage. A dual-core processor allows the AK240 to handle requests and play high-res audio files with no lag time, while users will also be able to connect to music download sites directly from the player.